Daniel Ortega and Rosario Murillo, Managua, 2014. In accord with the infantile manichean view of a significant portion of the US Left, the world is black and white and there are good guys and bad guys. This is a template into which everything must by political dogma fit. 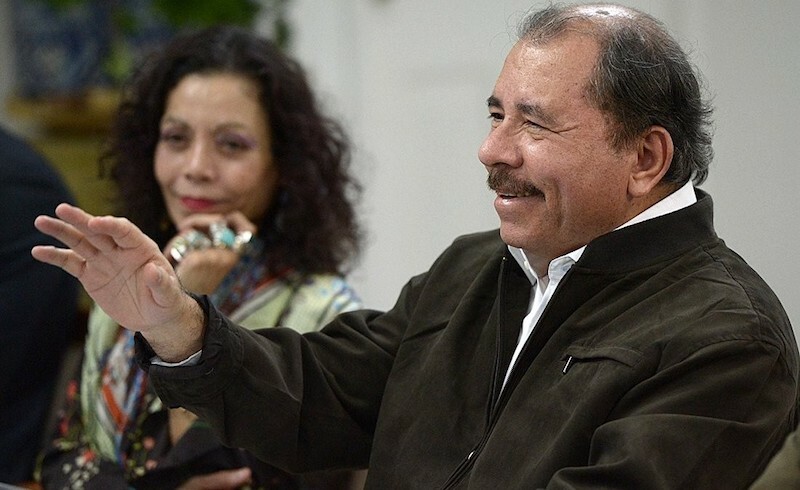 Since the US is intervening in Nicaragua (which it is, and which is condemnable) then, ergo, it is doing so in order to overthrow the regime of President Ortega and his wife, Vice-President Rosario Murillo, and ergo this regime must be the good guy. In these accounts there is absolutely no focus on — apparently a quite studious non-observation of — the internal contradictions in Nicaragua that have given rise to the crisis. There is little or no inkling of an understanding of the internal class, social, and political dynamics in the country, much less what exactly what the US is up to in Nicaragua or what its National Endowment for Democracy (NED) funding actually seeks to achieve. Yet the facts and the history are there for all those who actually wish to see them. Until the crisis, Ortega has had excellent relations with the US. His government has received US economic aid and even some military assistance. It has cooperated with Washington in the "drug war" and in its immigration policies. It has co-governed with the Superior Council of Private Enterprise (COSEP, the powerful umbrella association of Nicaraguan capitalist class) and has turned Nicaragua into a haven for transnational capital precisely by achieving the internal conditions (e.g., lowest wages in Central America, internal stability) for it to flourish in the country, which in turn has meant that transnational capital has poured massive investment into the country and helped generate those growth rates that the Harris and others applaud. Has the free provision of health and education been something positive? Absolutely. Has that earned the regime the enmity of Washington? Absolutely not. Social indicators have significantly improved, in part, because of high growth rates brought about by high commodity prices until a few years ago, by the massive influx of foreign capital, and by several billions of dollars in a Venezuelan subsidy to Nicaragua that has now almost dried up. The agricultural sector is not dominated by peasants but by transnational agribusiness while peasants have had to push out into what remained of the agricultural frontier, encouraged by the Ortega government which has provided support to peasants to do so. In the course of capitalist development in Latin America this is the well-known pattern of rural capital accumulation. The Ortega twist was to give some limited support to the peasant sector while simultaneously subordinating it to the agribusiness sector. Has the government handed out zinc roofs, pigs, and chickens to many poor peasant families? Yes. While this may be positive for those families, why should the Left consider this something revolutionary rather than the same clientelism as elsewhere (the Institutional Revolutionary Party in Mexico is a model). Since when should the Left be applauding that the IMF and the World Bank declares that the Ortega government is doing a wonderful job? Since when should the Left consider a government progressive (much less revolutionary) because it has generated all the conditions to attract transnational capital? Well then, should we not have applauded all the neoliberal regimes in Latin America for such commendation by the IMF and the World Bank, for how they have provided transnational capital with all that it wants? Has the Ortega regime, with its assistancialism, been anywhere near as “bad” as these other neoliberal regimes? Certainly not. But that neither means that its social programs have earned the wrath of Washington nor that it should be defended in the face of the mass opposition generated by its own project and by a course of capitalist development it has pursued that has now entered into crisis. This leaves the matter of US intervention. Articles from the US Left on the NED funding merely mention it without any understanding or analysis of what it seeks to achieve. This funding started in the mid-1980s and has never ceased. It is not new to the Ortega-Murillo period. In the 1980s it was part of the counterrevolutionary strategy. From 1990 and on it has sought to bolster pro-neoliberal/capitalist forces in civil society, to help these forces to achieve hegemony in civil society, to promote the transnational capitalist agenda in the country, and to prevent any radicalization of civil society. The funding under Ortega has pursued these same objectives. They have not been aimed at overthrowing Ortega, which is simply absurd, as Ortega has co-governed with these self-same forces bolstered by the NED. Washington's big concern is not getting rid of Ortega but in preserving, in the face of a crisis that sprung from internal contradictions, the interests of transnational capital in the country and the hegemony of capital over any post-Ortega political project. What the US most fears is an unstable and unpredictable vacuum of power in the country. But the problem is that that the traditional political right in Nicaragua (the Liberals in particular) are in a state of political disorganization, which leaves it to the business sector and its corporate (gremial) forms of organization to put together some sort of transition process. It is this business sector, its agencies and its think tanks, that has received most of the funding. This is the "soft landing" strategy of not pushing Ortega out too fast lest the situation spiral out of control. It is not a “color revolution” or “coup d’état” strategy against a revolutionary government. Should the US strategy of "soft landing" be condemned? Absolutely. Finally, have right-wing forces taken advantage of the uprising to try to gain control over it? Absolutely. Have these forces deployed their own violence. Yes. Have they manipulated a disorganized and politically incoherent grassroots opposition to Ortega-Murillo? Yes. Would the post-Ortega scenario the Right seeks to achieve be "more, not less, neoliberal, repressive, and authoritarian" than the regime, as the article suggests? Probably (note however that the neoliberal regimes from 1990 until Ortega took power never carried out the mass repression and the massacres that Ortega has!). But why should this mean that the Left should line up behind the neoliberalism, repression, and authoritarianism of the regime? That manichean view has no place in a Left approach to the Nicaragua.